The author on a ledge of the Sawtooth. During the summer of 2013, between my first and second years of law school (University of Wyoming) I moved from Laramie, WY to the Denver area. With an internship at the City and County of Denver Department of Excise and License, my girlfriend kindly offered to let me move in with her for the summer. This was the perfect opportunity to start checking 14’ers off my list! My girlfriend had done a few, and a lot of my new law school friends had done some, so it seemed like a cool thing to do. To check a 14’er off the list means climbing a mountain that is at least 14,000 feet high to its summit. One of the easiest 14’ers to start with is Mt. Bierstadt. It’s right in the Front Range, about an hour west of Denver on I-70. Along with its neighbor, Mt. Evans, they are the most prominent peaks you can see from the city. This seemed like the most logical place to start, so I grabbed a couple of my law school friends and made the arrangements. One of them, Tyler, was an experienced 14’er and had summited three peaks before. My other friend Joe and I were first timers. So, one fine summer day, Joe, Tyler and I woke up bright and early at 3:30 in the morning and started our adventure. It was about an hour from where we met to the trailhead, so we got there around 5:00 am, just as the sun was beginning to show over the peaks. It was a gorgeous way to start your day! 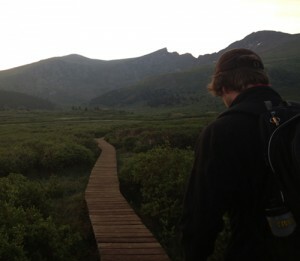 The boardwalk over the marsh we encountered at 12.000 feet above sea level. Looking at the peaks from the trailhead (in the top, feature photo), Bierstadt is on the right, and that jagged, scary looking ridge in the middle goes by the charming name of the Sawtooth. More on that later. This is just a day hike, so Joe, Tyler and I strapped on our Camelbacks and made our way to the trail. Now remember, the city of Denver is famously about a mile high — 5,280 feet. The trailhead where we parked is about 11,700 feet and Bierstadt’s summit is a solid 14,060 feet. We had already more than doubled our elevation from Denver just getting to the parking lot, so we had 3,000 feet to go and I was already breathing hard! It wouldn’t do to give up before starting, so onward we went. It is about 3.5 miles to the top, and the first mile or so was easy. Almost… too easy. I didn’t know this before we started, but there is a swamp up there at the pass. Who would have thought, a swamp at 12,000 feet? Anyway, the Forest Service had laid this wonderful boardwalk over the swamp so we could keep our boots dry. It was fantastic! Unfortunately, the boardwalk had to end at some point and when it did, the hiking got substantially more difficult. Well, not that much more difficult right off the bat, the next mile and a half or so was full of dirt trails and switchbacks. We made good time until we hit the boulder field. 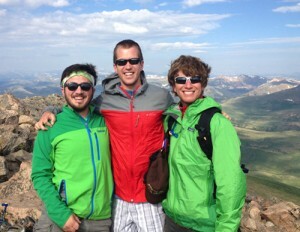 Three friends on the summit of Mt. Bierstadt. As the name implies, the boulder field is where the trail ends and you have to scramble over boulders to get the rest of the way up. The best route is marked with little piles of rocks, called cairns. They’ve been built up over the years by hikers who have come before and you make your way from one little rock pile to the next. This part was HARD. The boulder field started at about 13,500 and every step was rough. The first three miles of the hike took us about an hour and a half; the last half-mile took us about another hour. We made the summit at about 8:30 in the morning, and it was FREEZING. The puddles of water on the summit were frozen and so were my fingers after about ten minutes of being on top. Joe and I (the two guys in green, I’m the guy with the beard) were feeling pretty tired, but very accomplished, having just summited our first 14’er. However, Tyler, the guy in the middle, is a crazy person. He was bounding around the summit, full of energy and ready for the next challenge. The Sawtooth ridge connecting the two mountains. As I mentioned earlier, Bierstadt is connected to another 14’er, Mt. Evans, by a ridgeline called the Sawtooth. Naturally, Tyler figured that since we were already on top of Bierstadt, why not just cross the Sawtooth and hit Evans before heading down? No big deal, right? Wrong, but at the time he sounded convincing. So, we finished our snacks, gathered our wits and started down the Sawtooth. To the right is what we saw. Totally doable, right? Just make your way down a steep, boulder-strewn hillside, climb a nearly vertical rock wall, cross to the other side of the ridge, make your way up another steep, rocky ridge, then walk your way up to the summit, all while never dipping below 13,000 feet! It looked easy enough from where we were on Bierstadt, but it got significantly more difficult when we got there. We made our way down the mountainside until we got to the first cliff. Fortunately, we were following another experienced climber who had done the Sawtooth before, because those handy cairns were not to be found. The Sawtooth going up to Mt. Evans. Once we got up that, we made our way up the little ridgeline you can see going up the left side of the mountain about halfway up at a 45-degree angle. That is a hell of a climb. Very loose rock, very steep and every step up brought you half a step back down. At this point, Joe and I were so tired that we had to stop every ten steps to breathe. It is fairly terrifying to be so tired your legs are shaking while standing on the edge of a precipice overlooking a thousand-foot cliff. After many starts and stops and near falls to our death, we eventually conquered the Sawtooth. The view just from there was worth it. After the Sawtooth, we still had to walk about a mile and a half around the Evans’ peak before we could get to a place where we could actually make a climb to the summit. Being so tired at this point I forgot to take too many pictures. Mindlessly trudging along at almost 14,000 feet for 45 minutes when the summit is so tantalizingly near yet so torturously far away is awful, but it was worth it. Mt. Evans is accessible by one of the highest, if not the highest, paved road in the lower 48 states. That means that the summit is crowded with tourists who “hiked” the summit by driving their cars to the top, getting out, and walking the last quarter mile to the actual summit. I have never felt more superior to the masses than I did that afternoon standing on the top of Mt. Evans. The worst thing about making it to the top of a mountain is that you have to go back down the same way you came up. The hardest step of the whole hike is the first one down hill. Well, the hardest step mentally anyway. After all that work, we turned ourselves around and headed down the mountain, back to the car. Fortunately, we knew from some prior research that there is a secret little path down to the trailhead that allowed us to skip the Sawtooth and bypass Bierstadt. Since we really didn’t want to go back the way we came, we decided to try it out. A view of the Rocky Mountains few people see. Obviously there is no 3G service in the middle of the Rocky Mountains, so we were forced to do our best with our vague recollections of maps we’d seen the day before. After about 45 minutes of aimlessly wandering around the alpine tundra, we eventually found the path. It went down a beautiful little ravine carved out by a little alpine stream. What we didn’t realize when we decided to take the secret way was that we were going to have to go through the marsh that we had been so conveniently able to walk over on our way up. The Forest Service people had only built one boardwalk and we were going to miss it. That meant bashing our way though ankle to knee-deep mud and head high shrubs that didn’t want to let us pass, not to mention hidden pools of water. After hiking 12 miles up and down two different 14,000-foot mountains, the last thing we wanted to do was fight our way through a marsh. I don’t think I’ve ever seen another human so close to breaking as Joe was in that marsh. But we made it! After about a mile of hiking through the marsh, we happily rejoined the established trail and boardwalk. After that, it was just a hop, skip, and a jump back to the car! When we got there Joe and I were so exhausted we couldn’t even sit up to take our boots off. All I managed to do was lie down on the ground. It took an offer of pizza back in town to get me perked up enough to get the boots off and then get back in the car. All told, it was 13 miles and 11 hours spent on the mountains. That pizza was the best thing I think I’ve ever eaten. Andrew Forkes-Gudmundson is a 2nd year law student at the University of Wyoming College of Law. He grew up in Minnesota and got a bachelor of arts in history from St. John’s University. He graduated and moved to Japan, to teach English for a year. After returning to the States, he moved to Laramie, Wyoming, and enrolled in law school where he studies natural resource law. When he isn’t studying or working, he enjoys hiking, climbing, drinking the occasional beer, reading, and generally being outdoors. In the summer of 2013, he worked for the City and County of Denver, where he learned a lot about legalizing marijuana. 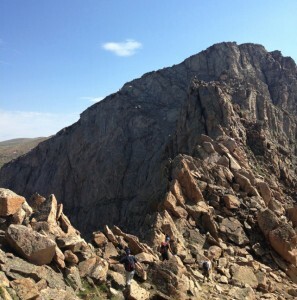 He also embarked on a mission to climb 14ers, and checked three of them off his list. Contact the author.